ACTON -- At 2 p.m. yesterday, classes ceased for a group of anxious fifth- and sixth-graders, and a television was turned on. 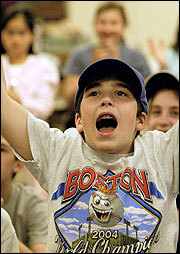 It was the moment the children had been waiting for, Opening Day at Fenway Park. The Yankees and Red Sox players were on the field, standing just a stone's throw away from each other. Inside the classroom, ground zero for the ''The Merriam School Handshake Project," little fingers were crossed. Silent prayers were sent. Since last fall, the students have been on a mission: to get the teams to set aside baseball's most intense rivalry long enough to shake hands before the game. The children's teachers hoped that the gesture would show that fierce competition and mutual respect can go hand in hand. Shortly after 3 p.m. came the moment of truth. Both teams had been introduced and were lined up across from one another. The Merriam School students, all 40 of them, rose to their feet. 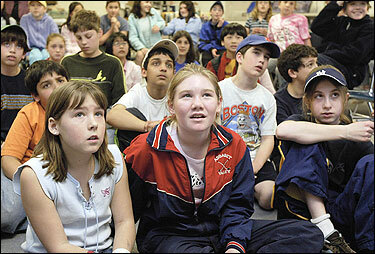 Their eyes were glued to the screen, and they began to quietly chant. ''Shake. Shake. Shake," whispered the students over and over again. The teams headed to their respective dugouts. The broadcast cut to a commercial. And the game began. Some students threw their hands in the air, while sighs of exasperation filled the room. ''What backstabbers," Colin Goulet, 12, said to his friend. There had been reasons to be hopeful. Both teams sent the students Opening Day letters praising the idea of a pregame handshake. Yankees General Manager Brian M. Cashman even sent the students 75 Yankees baseball caps. It is not clear whether the handshake idea will ever catch on. A Red Sox spokesman said the team had hoped to get managers Joe Torre of the Yankees and Terry Francona of the Red Sox to agree to make the players' handshake happen. But because Francona suffered chest pains that landed him in the hospital last week, the teams were unable to come up with an agreement by Opening Day, Red Sox spokesman Charles Steinberg said in e-mail to students sent yesterday morning. ''Regardless, however, of whether Terry and Joe Torre construct a symbolic gesture right now, the message that we felt, that you accented, is important and clear -- the teams in Major League Baseball should set an example," the e-mail read. Phone calls from the Globe to the Red Sox press office and the Yankees executive office were not returned yesterday. At Merriam, there was disappointment. Two teachers, diehard Red Sox fan Mary Ann Brandt, 60, and Yankees fan Ed Kaufman, 48, turned off the television and quieted the children down. A television news crew that had been recording the children's big moment prepared to leave. The project started off as a way to ease tension between the school's young Yankees and Red Sox fans from spilling into the schoolyard. The plan gained steam when news outlets from as far away as Germany and Japan began taking interest, requesting interviews from students. Despite the dashed hopes of the students, who lobbied both teams through letters and a sophisticated PowerPoint computer presentation, both teachers said that all was not lost. ''They know they've been heard and that they have a voice," Kaufman said. ''They also feel much more comfortable wearing Yankees hats around the building. We even have Red Sox fans wearing Yankees hats for the fun of it." Brandt's class even had a special surprise, an up-close look at a Red Sox World Championship ring, courtesy of a player who wished to remain anonymous. Still, many students went home yesterday feeling a tad slighted. ''It's kind of disappointing, because we worked so hard," said Hannah Joyce, 12. ''Well, it's tough, but they still might do it after the game," said Chloe Goodnough, 12, planning to go straight home and tune in. ''I wanted to see them shake hands; I really did, " said Rebecca Carvalho, 11.